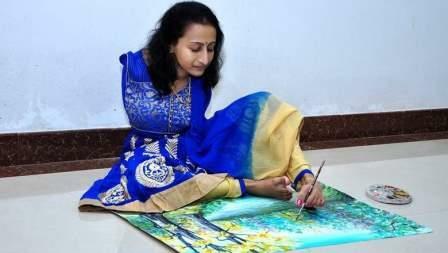 Impressed by the love and concern the UAE bestows on people of determination, an armless artist from India said "everyone is treated equally in the UAE". "I know the UAE leaders have termed disabled ones as 'people with determination'. I have a read a lot about this country and rulers supporting those with special needs," Swapna Augustine said. Swapna was born without arms. However, a determined Swapna turned her legs into hand. "I drew on paper from as early as Grade 3. I used to eat, write, draw and paint using my legs. I started with paper drawings with crayons and then moved to canvas paintings," she said. Fascinated by the concept of the 'Year of Zayed' and the vision of the founding father, the late Sheikh Zayed bin Sultan Al Nahyan, Swapna plans to draw a portrait of the UAE's Founding Father. "I can't do a portrait quickly. I will finish it from my home in Kerala. Now, it's a dream to return to the UAE with painting of Sheikh Zayed and present it to the rulers," said Swapna, who is on a short visit to the UAE. On Friday, she was at Dalma Mall Abu Dhabi for Mother's Day art competition. Swapna was thoroughly impressed by the work of local talents in the competition which was won by Aafra Ibrahim from Baraem Al Ain Private School, followed by Raghad Ali Fahmi from Al Maali International School and Adil Ajith Mamoo from Shining Star International School. Swapna also contributed a painting of a mother and child. "Not just winners but all of the participants have done an awesome work. There were participants from more than 50 schools. I haven't seen such variety of works anywhere else." Interestingly, none of family members have creative talent. "This is God's gift. I didn't get hands but got this blessing. My father passed away. I have two brothers and a sister. My mother Sofia and siblings lend good support. They all helped me in using my legs for all needs," said Swapna, who hails from Kochi city of south Indian state of Kerala. She celebrated Vishu festival with her relatives in Dubai. "I will also catch the landmarks across Dubai. I am excited about seeing Burj Khalifa," Swapna added.